This seems far, far away from “voter suppression.” The driver’s license Georgia issues to non-citizens – including illegal aliens who have already been ordered deported – is acceptable and “proper identification” when casting a ballot. This, according to multiple staffers at the main office of the Cobb Board of Elections and Registration office in Marietta when asked multiple times by this early voter last week. To get an answer I had to explain what a limited term license is. For those who are not well versed in the topic, the driver’s license DDS issues to foreigners is labeled “LIMITED TERM” across the top, which is the only difference between it and a U.S. citizen’s driver’s license. This brings to mind the several attempts in the last few years under the Gold Dome to clarify the limitations of the limited term driver’s license, which, generally, is supposed to be valid for the period of an alien’s visa. In the 2017 General Assembly, House Rep Alan Powell introduced a bill to add “INELIGIBLE VOTER” – which was a compromise to his original language, which would have added the term “NON CITIZEN” to the non-citizens driver’s license. Powell came under heavy fire from the illegal alien lobby and his attempt at driver’s license/voter ID reform died. More than 20,000 aliens who have received a deferral in deportation proceedings or who have already been ordered deported also hold the same limited term license according to information from DDS early this year. McKoon contended his bill would help prevent voter fraud and terrorism. The driving and ID credentials are also accepted as ID to enter federal buildings and to board airliners in America’s airports. Including the Georgia Association of Latino Elected Officials (GALEO), corporate -funded opponents argued such reform would “stigmatize” people and represented a ‘Scarlett Letter’ for “immigrants.” The legislation died in the House. 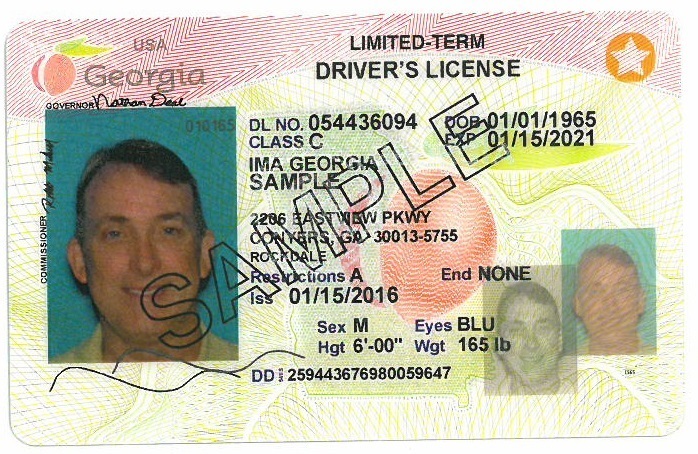 For this writer, the lunacy that a driver’s license designed and intended for foreign nationals is accepted as valid ID to vote in Georgia is surpassed by the fact that literally no official I have ever spoken to at my Cobb polling place over the years – supervisors included – had ever even heard of a “limited term” driver’s license.